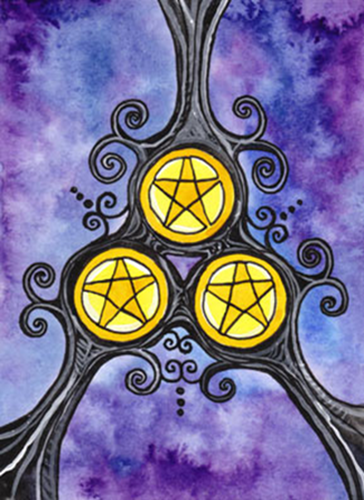 When I pulled the Three of Pentacles for this month, I couldn’t help but think that it feels right that this card opens up the part of the calendar that I adore. I absolutely love the time from the first of October through mid-January. October is all about Halloween/Samhain and November carries my birthday and Thanksgiving. December provides Yule/Christmas, which I love, even though I’m not religious. There’s just something so magical about the tree and the lights and the ornaments and presents and the smells of baked goodies and I just love it! I round out my personal year after New Year’s Day and my daughter’s birthday on the 1st and 2nd of January. After that, the rest of the months feel ordinary. Oh, and did I mention that football is going strong through these months? My not-so-secret guilty pleasure. I hope that you all have a lovely and successful October. For those of you lucky enough to live where the weather turns chilly around this time, know I’m wishing you well from the desert, where I dream about cool weather. Let the cooler temperatures innervate you into continued action and here’s to future success and celebration!